Three simple things attracted Jason Carey to NAA®: the leadership, the culture and the opportunity to have your own business and develop passive income. 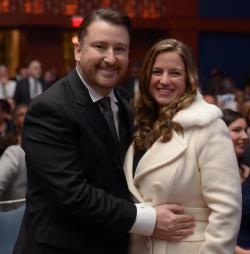 In 2006, Carey and his wife, Tawny, were struggling mortgage brokers with insurance licenses. They both wanted to expand their business, but hadn’t found the right atmosphere to make that happen. Carey, who resides in Los Angeles, Calif., put his resume on Monster.com in March of 2006 and started looking for something that would allow him to make more money while closing the loans he and Tawny were dealing with. Carey stumble upon NAA® and ended up on the phone with Jim Glascott, after Glascott saw Carey’s resume online. Carey met with Glascott, signed contracts, got a phone script and left with some old leads. A week later, Carey closed his first sale. The Careys have been with NAA® ever since. Prior to joining NAA®, Carey never made more than $75,000 in a year, but now makes around $300,000 annually. NAA® provided the leadership, culture and opportunity Carey was looking for and he took advantage of it.